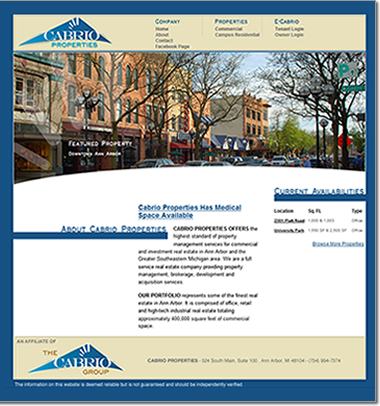 Cabrio Property is a commercial and residential property management company located in Southeastern Michigan. Lurus built a solution that allows them to easily post and update their property availabilities as well as maintain a secure archive of financial documents for property owners. The Cabrio Properties website contains the 'eCabrio' system which includes a property owner logon area to track property owners portfolio of investments.